Thank you.Can you tell me when the interview was? It is very recent! We did it 5 days ago! 1 - When, where and why did you start to play volleyball? That's something you have ever dreamed of? 2 - You went to play in Italy at a very young age. Why? Do you consider that experience to be essential in your carreer as a player? I went [to Italy] because I thought that the proposal was very good, both financially and for my professional growth, after all I went to play in the best volleyball league of the world! 3 - You returned to Brazil for the season 2008/2009. What was the reason? I came back because I had a good finantial proposal and because I wanted to be close to my family. The best players of the world are [playing] in Italy, and here in Brazil it [the league] started to grow strong in the last two years. 4 - In the previous league (2008/2009) it was expected that São Caetano could reach the league finals, but didn't make through the semis. Do you believe that this year the team has potential to reach the championship's finals? [Yes], I believe. I think that we aren't in the best shape yet as a group, but we will improve. 5 - Tournaments like the World Cup and the World Championship are played away from home and you play many games in a row. How do you keep fit to endure the marathon of matches? We prepare ourselves during the whole year to play championships like that. And our coaching staff knows what to do so we can be in good physical shape during the championships. 6 - The Brazilian national team was, in general, mocked by many people for losing decisive matches. Did you believe that Brazil could become Olympic champion? I was sure [we would win]. 7 - What is, in your opinion, the differential of Brazilian national team compared to others? Our training, with ball and the physical [part]. 8 –What are your next goals? 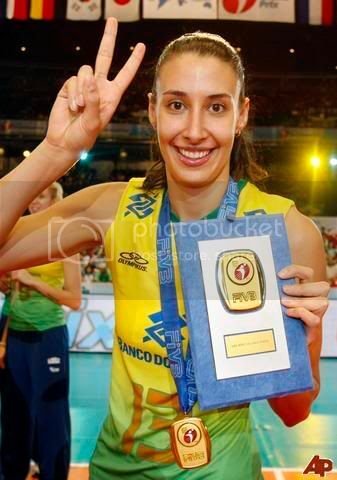 This year my goals are winning the Brazilian league (Superliga) and the World Championship. For example, when Gustavo Kuerten (tennis player) started winning tournaments, many children started playing tennis because Kuerten was their new idol. It is probably happening now with athletism (Usein Bolt) and will happen with other sports too. And also the rule is simple: if the team wins, they get air time, otherwise, most likely they won't get any air time at all. I already heard that maybe some USA channels start broadcasting volleyball matches. Not certain, but they showed interest after USA got the silver medal in Beijing. The only problem is, they win silver at OG and lose almost everything else But no matter what I support this team and would wake up in the middle of the night to watch them, no doubts ! Anyway there are so many good videos here haha Just to end my (useless) post, wanted to say that when Anja Spasojevic finishes her career she can go singing! Logan already played in Japanese league last season, and I think the term "comeback" isn't really appropriate for Kirillova either, and in my opinion she showed last season in Dinamo that she still is totally capable to play on a high level. Oh so great!! So she gave up beach volleyball for real this time?? Irina Kirilova also in Asystel Novara. Nancy Metcalf and Annerys Vargas in Minas Tennis Club (BRA). hehe it caught me by surprise! But I must say... they are the whole team. Eleonora Lo Bianco made her debut for serbian NT!!!! At the beginning of fourth set serbian setter Ana Antonijevic had to leave the court due to pain in her tendon and Maja Ognjenovic couldn't replace her because of pain in her back .So Lo Bianco passed over to serbian side and played a set for Serbia. Now I know what we will do if Maja doesn't improve her game.We will take Leo! Terzic already said that next time she will get serbian passport! haha so nice!! It was something we don't get to see everyday! Is there any video of that? I like Ognjenovic! I think she's a great setter, sometimes she does some mistakes but still good! Erika had a great chance in 2007 but just didn't take it... she didn't do good on WGP. Hey Joana, did you record Germany x China?? it was an amazing match Made my night worth!! I honestly expected that from USA. They did the same thing 4 years ago, because it is a great opportunity to test players, especially when you don't have a professional league at your own country. Also, most veterans take this time to rest or recover from injuries, because playing many years non-stop makes you need to stop at one point. Most teams aren't playing with their main players, which was expected and probably for the same reason USA didn't take their main team to the WGP. And I don't think that being in a hard group is a problem, even if they didn't classify they did good matches and also got more experience. Maybe they just pick the groups based on other things... being "home distance" (or maybe $$$ ?) one of them, for example. yeah Thaisa hid her husband so well. Everybody felt surprised that she is gonna marry.Congrats to her. And Marcelle is pregnant with their first child! I just came across with this thread... and I must comment... what magnificous venues!! I had never seen it... it is wonderful both in the inside and also outside too!! yeah! it is a funny name. And Erika's mom looks more like her husband's mom. Sometimes I am confused about some Brazilian players' descents. Erika is blonde. And her mom is brunette. So Erika 's dad is blond. I think Tom should decide, either beach or court... I think things are pretty easy for her, because she can do whatever she wants for 3 years and then in the last the coach just calls her back because there isn't other player for her position with the same quality. Anyway, even if McCutcheon asks her, I think she won't be back. I think it's time for getting new players to replace the older ones, but in my opinion it's important to have a transition time, older and younger players on court together so they can learn how to handle things.